It’s early in the college football season. My alma mater is 2-0, including a win in its opener on a last second field goal. On Monday, the school got even better news. Penn State—my alma mater—had its post-season ban lifted and will receive its full allotment of scholarships next year. Yay, go State. Rah Rah. I should be feeling all that, I suppose. And I am to some degree, but I don’t necessarily want to talk about that. It’s been nearly three years since the horror of the Jerry Sandusky child molestation scandal has been brought to light. Much has changed about the University. Sandusky (who was no longer a coach on the team) has been convicted and is serving a minimum 30-year term. Graham Spanier, the president of the University, was forced to resign. Tim Curley, athletic director, was fired. Legendary coach Joe Paterno was also fired. The University has paid out millions to the victims. The football team itself has undergone onerous sanctions. The team had its second new coach (not including the interim coach who completed the 2011 season)—James Franklin—on the sidelines since Paterno was fired. This entry was posted in Sports and tagged college football, Jerry Sandusky, Joe Paterno, penn state by lardavbern. Bookmark the permalink. That’s gotta be tough and you know how I’m such a BIG college football fan. I’d feel the same way as you do if that was my team. At least my Dawgs are off to good start. College football and sports in general are big $. Any big $ venture can push people to do things they would probably normally not do. Such an awful thing, but they took care of it. Can’t forget about it but there comes a point where you can say you have done all you can to make sure it doesn’t happen again and you move on. I suppose they took care of it. I think the pressures of money that comes with college football (in this case) can cause some people to act in ways they would not normally act. Someone should have stood up. Btw, I did watch their game this evening and cheered when they won. I remember that. What a sad situation. Truly was horrible. I don’t think there is anything worse than preying on children. I feel your pain. There have been a few situations where I have lost pride in an entity (my family, the church, etc.). It’s so hard to balance that disappointment with your past feelings. It’s hard to find hope that the future of said entity will ever be as good as it once was. I hope you find your groove for your team. I like that you were able to remember that these young men haven’t done anything wrong and still deserve your support. Balance is the right word. I am striving to find that. I graduated from Penn State, and I still wear my Penn State shirts. I have gotten several negative comments while wearing them, as if I am a personal representative of the offending parties. What happened was disgusting, but I never agreed with punishments that affected the football players, who were not the ones who did anything wrong. Ahh, we have something in common. It’s not fair that we should be blamed for what occurred, and it’s not right that the players should be blamed. Btw, I watched the game on Saturday night and was very happy when PSU won. Well, I’m not much of a football fan, but I can certainly understand the feeling of being hugely invested in something that goes terribly, terribly wrong in some fashion. It’s terrible. On a lighter note, I love your new header on the website! It’s extremely awesome. Thanks for noting the header. I appreciate the positive feedback. It truly was a terrible situation and still is for those who are suffering from the after affects. 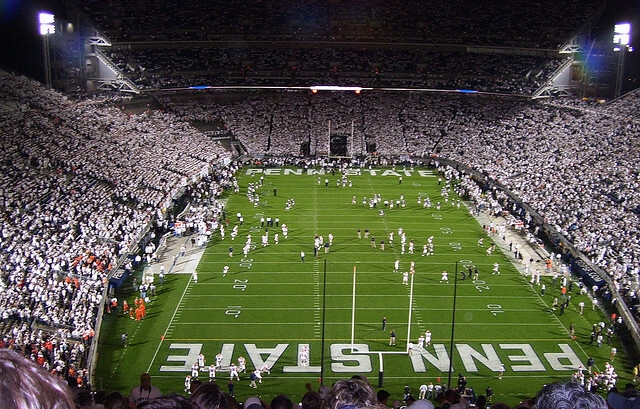 I work with a Penn State alum, and I was shocked with how he excused Paterno’s carelessness. He summarized Paterno’s apparent response as this: “Here’s the information, now I’ve got a football team to run.” The rest of us are left wondering how the word “football” would ever factor into a conversation about protecting children from vile abuse. And yet I think also there comes a gang mentality from many ordinarily good people when confronted with a situation where one needs to step up. I can think of several times in history where that has been the case. This case broke open in the same year that the university where I am employed announced that we would start a football program. Most people here are opposed to it. Football changes a place. There can be a shift in priorities of the administration to protect and preserve it, for one thing, and football can turn a school into a party school in short course. I try to see the best when it comes to Paterno and this situation buy my wife brings me every time. I had such respect for him so that it’s hard for me to believe that he handled this so poorly. I think it is money/power mentality. There was alot at stake and people wanted to feel the situation would rectify itself. They did not take enough action to make sure a deviant away for fear how it would look on the university.